Due to the tremendous escalation of the armed conflict, the Ancient City of Aleppo has been severely damaged since 2013, and is undergoing regular destructions due to bombardments, targeted explosions (bombs detonated in tunnels), fire and street combat. On 14 January 2015, the State Party submitted a state of conservation report for the six World Heritage properties in Syria, which is available at: https://whc.unesco.org/en/list/21/documents. The report indicates that access to the historical area is impossible due to the ongoing fighting. Thus the State Party report relies on non-official sources such as the local community and social media. In addition to the destruction reported in 2014, the report indicates that the private houses in the northern areas of the old town have been heavily damaged and that all public infrastructures, in al-Hamidieh district, Bustan al-Qasr district, Qustul Harami district, al-Farafra district, Akyol area, the area around the Citadel, Bab al-Neirab, and al-Awamid area near the Umayyad Mosque, have been damaged to different extents. The report also indicates that the protective roof of the Hittite Temple of Storm God in the Citadel has been totally destroyed, and it reports damages to the Fish Suq, Wool Suq, Sisi House, Mrish House, Poche House, Khan al-Khbash, Khan for Silk, Khan for Cotton, Khan al-Kerknawi, Khan Kheirbek, Suq al-Ghazal, as well as to religious historical buildings such as Mosque al-‘Adliye, Mosque Ottomania, Mosque al-Kamailya, Mosque Bashir Pasha, Mosque al-Mihmandar, Mosque Banqosa, Meng Great Mosque, Mosque Haroon Dada, Mosque al-Shu’aibiyya, Mosque Qustul Harami, Mosque al-Sahabh, Mosque al-Maydani, Mosque al-Utruch, Mosque al-Haddadin, Madrasa al-Firdaws, Madrasa al-Hallawiya, Madrasa al-Sharfih, Madrasa al-Trtanik, Madrasa al-Shibani, Madrasa al-Ahmadiya, Maronite Church, Church al-Shibani, church of Roman Catholics and Church St Dimitros. the Citadel is threatened by armed groups who have detonated bombs in tunnels in the Old City, causing damage to the Carlton Hotel, the Palace of Justice, the Police Headquarters (al-Qalam building), the Grand Seray, Mosque al-Khusruwiye, Mosque al-Sultania, Khan al-Shouna and Hammam Yalbouga. the National Museum and the Department of Antiquities have been partially damaged due to blasts and mortars, and the Directorate General of Antiquities and Museums (DGAM) team managed to access in March 2014 the Museum of Folk Arts (Atchiqbach House) which structure suffered minor damage but where many architectural elements disappeared, and to access in September 2014 the Ghazaleh House which suffered severe damage due to clashes and looting of the wooden decorative wall panels and decorative glass. the DGAM Branch of Aleppo has undertaken preventive measures, such as archiving all drawings in digital format, transferring the decorated doors and the collection of the Museum of Folk Arts to a safe location, and monitoring the damages, when possible. In addition to these damages, and to those reported in 2014, satellite images provided in the December 2014 UNITAR/UNOSAT report show the destruction of Khan Fatayyin, Khan Ibaji, Khan Jiroudi, Khan Nasser, Suq Aqqadin, Suq Bazerjiya, Suq Dra’, Suq Haraj, Suq Manadil, Suq New Istanbul, Suq Qawooqiya, Suq Siyah, Qaysariya Darwishiya, Qaysariya Hakkakin and of public toilets and a state hospital, both in ancient historic buildings. They also show severe damage to an important number of other historic buildings. Other sources report damages to the Mosque Qadi al-Akar, Matbakh al-Ajami, Mosque al-Sarawi, Mosque al-Muhtaseb, Mosque As Sajir, Khan at-Tatan and Khan al-Mesri. The Old City of Aleppo has been severely damaged due to the armed conflict and very large portions of the property appear to have been completely destroyed. Some experts estimate that 70% of its core zone has been affected by this large scale destruction and compare it with Berlin and Warsaw after World War II. Some of the most important monuments and historical neighborhoods of Aleppo may have been erased from the map. Moreover, the destruction is ongoing and there are no signs that it might stop. The Old City and the Citadel are at the heart of the combats and are fully militarized. In the face of this devastation, UNESCO is proposing an experimental designation of “protected cultural zone” in the framework of the United Nations efforts to reach a cease-fire in Aleppo. For this purpose, the World Heritage Centre is preparing a desk study on the detailed state of conservation in Aleppo, on the stakeholders who should be involved in the reflection over reconstruction and on an overall feasibility study for the possible implementation of UNESCO’s proposal to designate and safeguard the “protected cultural zones” in Aleppo. While the potential designation and safeguarding of “protected cultural zones” might lead to mitigating further destruction in some important pockets of the property, the World Heritage Committee is faced for the first time with a World Heritage city that will need extensive reconstruction. An in-depth reflection on the nature of the corrective measures to be envisaged in such a case is needed. This reflection will be initiated in a technical meeting that the World Heritage Centre is organizing in May 2015, in partnership with the Advisory Bodies, on post-war reconstruction in the Middle-East context, focusing on the Old City of Aleppo as a case study and involving multidisciplinary experts and stakeholders, in particular from Syria. The meeting will aim to set out basic recommendations on reconstruction from a theoretical and practical point of view, and will contribute to policy debates on Aleppo’s reconstruction, building on those that took place in 2014 and 2015 in Aleppo itself, and on others in national and international academic circles. See item 36 of this Document (General decision on the World Heritage properties of the Syrian Arab Republic). The armed conflict in Syria started in March 2011 and has constantly escalated leading to significant violence and degradation of humanitarian conditions. Since the 38th session of the World Heritage Committee in 2014, the destruction of Syria’s exceptional archaeological, urban and architectural heritage has reached a deplorably high level and has continued to seriously affect all six inscribed properties, the twelve sites inscribed on the Tentative List, and a wide number of highly significant cultural heritage sites all over Syria. Cultural heritage in Syria continues to be damaged by shelling, street fighting, targeted explosions, extensive illegal excavations, and use for military purposes and as military training areas, construction violations, and quarrying, in addition to intentional destructions and inappropriate use of archaeological sites by internally displaced populations. On 14 January 2015, the State Party submitted a state of conservation report with detailed information on the destruction and damage at the six World Heritage properties, available at https://whc.unesco.org/en/sessions/39COM/documents. On 12 February 2015, the State Party submitted the state of conservation report of all the sites on the Tentative List and a report on the intentional destruction of built heritage. These reports represent an official statement from the Syrian authorities and collate available information from the branches of the Directorate General of Antiquities and Museums (DGAM) and from social media. However, the State Party notes that ground access in Syria is extremely limited for heritage experts, and the full extent of the damage to World Heritage properties cannot be assessed in detail at this time. Therefore, the reports do not provide first-hand information on several sites, in particular the Ancient City of Aleppo and the Ancient City of Bosra, and thus do not allow a full understanding of the extent of damage to the properties. For the preparation of the state of conservation reports for the World Heritage Committee, additional information was sought from civil society organizations, international organizations, local experts and the media to supplement official data. The State Party reported on the work carried out by the Directorate General of Antiquities and Museums (DGAM), despite the difficult working conditions, to monitor the World Heritage properties and cultural heritage in general, assess damages, undertake emergency conservation and risk mitigation actions whenever possible, and inventory built and movable heritage. The report also stressed the DGAM efforts in raising local awareness and highlighted the positive role played by local communities in some cases to safeguard heritage and limit illegal excavations. In the ‘Noreas of Hama’ site, on 8 August 2014 the Noria-Gaabariyya near al-Nori Mosque was burned down; the fire burned the upper part of the new wooden wheel, while the stone base remained intact; the Hama Municipality immediately started conservation works. In the site of ‘Ugrarit (Tell Shamra)’, on 20 July 2014, a fire of non-criminal origin burned some unexcavated parts and few excavated areas without causing major damage to the archaeological remains. The site of ‘Ebla (Tell Mardikh)’ has been affected by illegal digs and excavations as well as by natural degradation. Minor destructions are reported at the Acropolis. Recently a new oil-refinery about 400 meters to the West of the site was reported. The site of ‘Mari (Tell Hariri)’, in particular the Royal Palace and the Temple area, has been affected by extensive illegal excavations carried out with heavy machinery by armed groups residing in the site’s visitor centre, which, together with the residence of the mission, has been robbed. The site of ‘Dura Europos’ has been extensively damaged by looting, vandalism and large-scale illegal excavations carried out with heavy machinery; the looting involves the participation of hundreds of local inhabitants in economic need, who are reportedly paid by the armed groups controlling the site and a third of the discoveries’ estimated value. In October 2014, the armed groups were reported to use the archaeological site as a military shelter. The site of ‘Qasr al-Hayr ach-Charqi: a desert Castle’ has been occupied by armed groups since 2013. The castle and the surrounding area have been damaged by digs, looting and vandalism. The excavation house has been robbed. In the site of ‘Maaloula’, damages, looting and vandalism were reported in most of the monasteries, churches and shrines, and in the old town, including in the cemetery and in the caves. In the site of ‘Raqqa-Rafiqa: the Abassid City’, illegal excavations using heavy machinery at al-Atiq mosque and the destruction of the Sufi shrine within the mosque were reported. One Iwan in the Bimarstan Qasr al-Banat was burned; degradations due to natural factors were observed on the Bagdad city gate and the city walls. The site of ‘Apamea (Afamia)’ and its surroundings has been extensively affected by illegal excavations carried out by armed groups who have been targeting mosaics, using heavy machinery and metal detectors (since 2014). No damage is reported at the sites of ‘Tartus: the Crusaders Citadel-City’ and of ‘Arwad Island’. The shrine of Sheikh Muhammad Nabhan in the Kiltawiye Mosque at Bab al-Hadid, one of the historical gates of the Ancient City of Aleppo World Heritage site, was destroyed on 17 January 2015. The DGAM accessed the Shash Hamdan Roman cemetery in Aleppo Province where carved reliefs were deliberately targeted by gunfire and smashed into fragments. In Northern Aleppo, all the shrines in Menjib have been destroyed, including Maqam Sheikh Aqil al-Manbiji, have the shrines around the Byzantine church and the six Mamluk Shihab al-Din tombs in front of Najim Castle. The shrines in Ezaz were destroyed by bombs, including the Sufi tombs at the archaeological tells of Ezaz, Sawran, Shiekh Rieh, Dabik, and Akhtarin, as well as the tomb of Nabi Daoud in the village of Dwebek. According to unverified information, all the tombs in al-Bab district, Zerba Nahiyah, Hader, Atareb, tell al-Daman, Maskanh, al-Khasfa, and Deir Hafir have been destroyed. The recently built Armenian Genocide Memorial Church and complex in Deir ez-Zor were destroyed on 17 January 2015. The Sufi Muslim Uwais al-Quarani mosque and Ammar bin Yasser shrine in Raqqa were destroyed in March 2014. The shrine of Wabsa Ibn Mabad al-Assadi within the Great Mosque in the old town of Raqqa-Ràfiqa has been destroyed. An armed group blew up and destroyed a sixth-century Byzantine mosaic which was discovered in Tell Saeed near the city of Raqqa. On 26-27 May 2014, in the framework of the European Union-funded “Emergency Safeguarding of Syrian Cultural Heritage” project, with co-funding from the Flemish government (USD 170,000), UNESCO organized an international expert meeting to help rally the International Community to safeguard Syria’s cultural heritage. 120 international and Syrian experts from 22 countries and UNESCO’s partners took part in this meeting and produced a detailed action plan, which provides short, medium and long term actions to safeguard immovable, movable and intangible heritage. Since the 38th session of the World Heritage Committee (Doha, 2014), UNESCO has pursued its actions to assist the State Party in its continuous and sustained efforts to safeguard cultural heritage. At the international level, UNESCO raised the awareness of the international community on the destruction of cultural heritage in Syria; these sustained efforts led to the adoption by the United Nations Security Council of Resolution (UNSC) 2139 on 22 February 2014 which called « on all parties to immediately end all violence which has led to human suffering in Syria, save Syria’s rich societal mosaic and cultural heritage, and take appropriate steps to ensure the protection of Syria’s World Heritage Sites ». On 3 December 2014, UNESCO organised at its headquarters an international conference on the “Protection of Heritage and Cultural Diversity at Risk in Iraq and Syria”, with financial support from the Government of Kuwait, and called for the creation of “protected cultural zones” around cultural heritage sites, suggesting a start could be made with emblematic monuments in the Ancient City of Aleppo. On 12 February 2015, the UNSC adopted resolution 2199 that condemned the destruction of cultural heritage and adopted legally binding measures to counter illicit trafficking of antiquities and cultural objects from Iraq and Syria and called on UNESCO and other concerned entities to implement this ban. A Meeting with the DGAM and project partners was held in Paris on 28-29 October 2014 to plan and coordinate actions to safeguard Aleppo’s cultural heritage and museums. The meeting provided technical recommendations and risk mitigation measures for the Ancient City of Aleppo. A Training course on “First Aid to Built Cultural Heritage in Syria” was co-organised by the UNESCO Beirut Project team, led by ICCROM ATHAR and co-funded by the Arab Regional Centre for World Heritage; the workshop took place at the UNESCO Office in Beirut from 24 November to 6 December 2014 and provided intensive training to 22 DGAM technical staff and representatives of NGOs across Syria. Twenty two professionals from coming from Aleppo, Damascus, Daraa and Homs participated in this intensive course. Participants benefited from the expertise of various professionals who have been involved in several aspects relevant to the fields of: risk assessment, damage assessment, debris management, first aid to cultural heritage, and emergency consolidation of damaged monuments and sites. A Workshop on improving inventories of built, movable and intangible cultural heritage, which gathered all relevant partners in this field took place in Beirut from 16 to 18 February 2014 and allowed working towards harmonized data gathering and inventories, in view of future actions to conserve, restore, reconstruct, and organize the fight against illicit trafficking. In May 2015, the World Heritage Centre will organise a technical meeting on post-war reconstruction in the Middle-East context, focusing on the Ancient City of Aleppo as a case study. The meeting will set out the basic recommendations on reconstruction from the theoretical and practical points of view. ICOMOS has supported many of these and other initiatives. Providing technical advice, capacities and information in order to allow the implementation of activities describe in Articles I, II and III of the present agreement. At its 18th General Assembly, in Florence in November 2014, the ICOMOS Executive Committee tasked an ICOMOS Working Group on the safeguarding of the cultural heritage in Syria and Iraq, to cooperate with UNESCO and other international and national partners, and with the support of ICORP, to coordinate the activities of ICOMOS related to fostering cooperation and exchanges, monitoring, awareness raising, communication, training, assisting and planning for the safeguarding of cultural heritage in Syria and Iraq, as long as the present conflict and its subsequent consequences continue. The armed conflict situation in Syria and its continued escalation has affected the six World Heritage properties and has substantially limited the capacities to adequately sustain and protect their Outstanding Universal Value (OUV). The properties are increasingly threatened by a specific and proven imminent danger, in particular the Ancient City of Aleppo, which has been extensively destroyed and which runs the risk of further irreversible destructions, including its Citadel. The illegal excavations across archaeological sites and tells in Syria are a major source for the illicit trafficking of cultural objects and are causing extensive and irreversible damages to those sites, as well as providing looted artefacts for sale in regional and international black markets. It is recommended that the World Heritage Committee commend the DGAM and all heritage professionals in Syria and local communities who have made sustained efforts to protect cultural heritage and to monitor it closely. Furthermore, it is recommended that systematic documentation of all damage incurred at the World Heritage properties be duly pursued whenever the situation allows, and that the World Heritage Committee reiterate its call to the State Party to safeguard damaged property through minimal first aid interventions to prevent theft, further collapse and natural degradation, and refrain from undertaking other measures until the situation allows for the development of a comprehensive strategy and action plan that respond to international standards and high-quality scientific methods. With regard to post-conflict reconstruction, it is recommended that the World Heritage Committee call on the State Party to plan the future of World Heritage properties according to international conservation charters and standards, in full consultation with the World Heritage Centre and the Advisory Bodies. Until conditions improve, it is also recommended that the World Heritage Committee call upon all parties associated with the conflict in Syria to refrain from any action that can further damage the heritage of the country, in particular World Heritage properties and all sites included on the Tentative List, and to fulfil their obligations under international law by taking all possible measures to protect such heritage including the evacuation of World Heritage properties used for military purposes, and the halting of all damages that result from targeting World Heritage properties. It is further recommended that the World Heritage Committee call upon all parties associated with the conflict in Syria and the international community, in particular the neighbouring countries to Syria, to ensure effective measures for the fight against illicit trafficking of cultural objects, in line with the UN Security Council Resolution 2199. 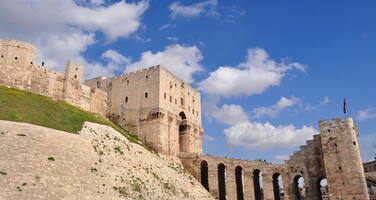 Decides to retain the Ancient City of Aleppo (Syrian Arab Republic), on the List of World Heritage in Danger. Further requests the State Party to submit to the World Heritage Centre, by 1 February 2016, an updated report, including a 1-page executive summary, on the state of conservation of the property and the implementation of the above, for examination by the World Heritage Committee at its 40th session in 2016.